Now that my new first draft of my book is done, it's time to jump right in to one of the most important parts of the writing process: editing! This past week, I've been reading through at least three chapters a day and taking notes on what I liked or didn't like about the chapter and how that chapter works with the overall plot. Doing this has resulted in a lot of rearranging and the creation of additional chapters, which I will write when I start actually editing next Monday. And while I know I've done a lot of posts on this blog about editing, I want to share some of the editing tips that I learned at the 2017 Michigan Writing Workshop I attended a few weeks ago. All of this information comes from the notes that I took from the class "Talking Craft and Revision" by author D.E. Johnson. It was one of my absolute favorite classes at the conference because it was just chocked full of such good information! When it comes to editing, one thing is certain for all writers: get through your first draft before editing or rewriting. It doesn't matter if the writing is awful--just get the first draft done! After you have a completed draft to work with, Mr. Johnson suggested looking at your story in the following way: characters first, plot second, and language last. This surprised me. I always thought that plot was the most important part of the book and should be edited first. Who cares about the characters when the plot has holes in it? But the more that I listened, the more I understood. Do all of my characters make sense? Are they consistent throughout the book? Do they do what they're supposed to be doing? Though I was skeptical, I decided to give this method a try and focused on my characters while reading through my book this past week. Doing so made me realize how flat some of my characters were! Some of their personalities weren't matching up with their dialogue or actions. One of my characters, whose main role is to be a protective big brother, was hardly around his sister. And when he was, he was awkward and weird and not big brotherly at all! Had I just jumped straight into trying to fix all the plotholes, I might not have caught my character issues. Which leads me to the next point. Does every word propel the story forward? Does the plot help the reader understand my characters? This is where the term "kill your darlings" comes into play. Though those emotional scenes with fantastic word choice and sentences that flow like poetry are fun to write, they don't always end up being beneficial to the story. Unfortunately, they end up as just unnecessary words. One of my biggest problems right now is trying to make sure everything propels my story forward instead of halting it or sending the plot backwards. For a while, I struggled with a plot that went up and down and halted, then up and down and halted, then up and down, etc. So make sure your words count! Focus on moving the story forward and developing your characters. Finally, Mr. Johnson suggests focusing on language last. Word flow, word choice and usage, consistency, etc. He suggests that for this step, read your entire book out loud! Hearing a written format out loud can help you hear mistakes better and also lets you see whether or not your dialogue sounds natural. "When the character and plot problems are resolved, it's time to listen." So those are the basics of D.E. Johnson's 3-step editing method. So far, I like it! It's different than my usual editing regimen, so it's allowing me to see my book differently. My deadline for my first round of read-throughs and notes is this Thursday, and then it's onto the real edits! 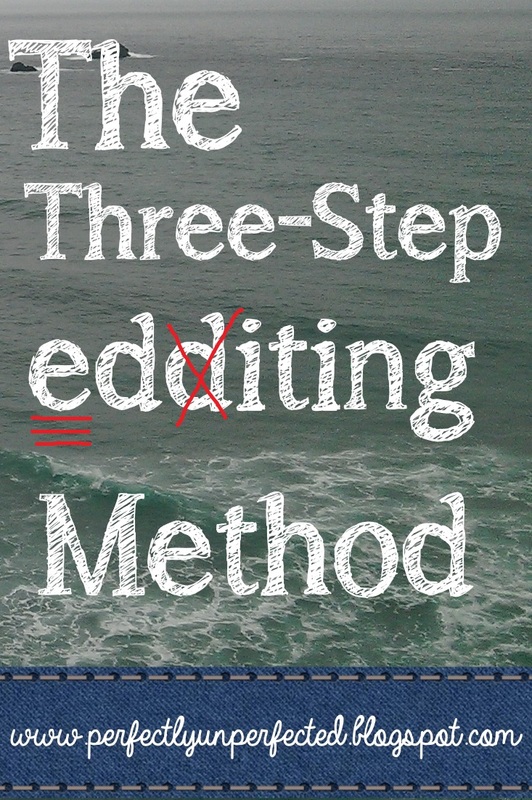 This sounds like a really useful method for editing. I'm going to have to keep it mind when I edit the current draft I'm working on.